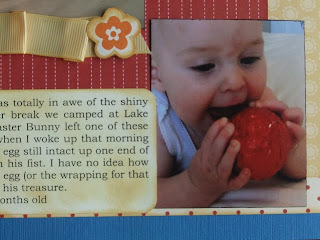 This was Samuel’s first Easter and he was totally in awe of the shiny foil wrapped Easter Eggs. For the Easter break we camped at Lake Keepit and early Sunday morning the Easter Bunny left one of these eggs in Sam’s cot. Imagine my surprise when I woke up that morning and looked in his cot to see the chocolate egg still intact up one end of the cot and the foil wrapping rolled up in his fist. I have no idea how he managed to do it without breaking the egg (or the wrapping for that matter) but he was certainly pleased with his treasure. 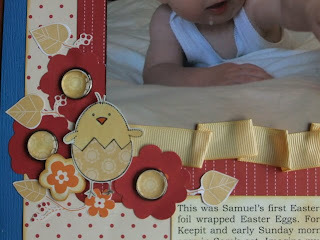 Here is a close-up of the flowers and little chick from the A Good Egg Stamp Set. I have cut flowers from my patterned paper and then used Build-a-brads with co-ordinating paper for the centres. I have also use the same paper for the little chick's shell. The ribbon was from a freebie ribbon bundle that was available last year and co-ordinates perfectly. 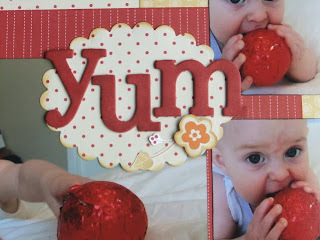 For my title I have used Chipboard letters sponged with Riding Hood Red Ink. I printed my journalling on Very Vanilla card and then sponged over the top with So Saffron ink. 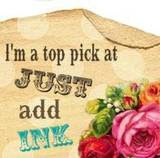 Be sure to check out all the gorgeous creations at Just Add Ink. Awesome LO, Lisa - beautiful. Great photos, beautiful layout with all the exquisite detail!! I'm really tempted to do my first scrapbook page as I've been so inspired by the lovely creations of all the talented entrants, with yours being one of them. Thanks for joining in the fun at Just Add Ink. Lisa your page is awesome! Like Bron said, the detail is just beautiful. Your wee man is such a cutie pops! My daughter is that age now, and every day is full of wonder :) Well done! Oh my. This layout is divine!! Great take on the challenge, love it to bits. Thanks for playing at Just Add Ink! 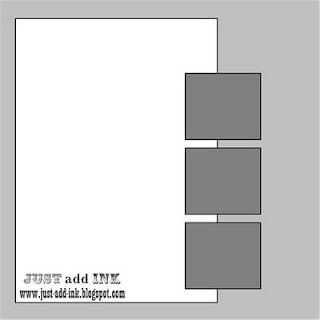 Super-cute layout, Lisa. I love the chick and your cut-out embellishments. Oh, and your ADORABLE bubby! Soooo cute! Your work always has so much depth and detail - love it! Thanks for playing at Just Add Ink! What a great layout. Your work is just lovely. Congrats on making top 5 at JAI.